Place the cashew nuts in a blender or small processor with the garlic, ginger and 4 tbsp cold water. Process to a paste. Heat half the oil in a medium heavy-based pan and brown the lamb on all sides in batches. Remove with a slotted spoon. Heat the rest of the oil in the pan and add the chopped onions. Cook over a medium heat for 5 minutes until softened and browned. Add all the spices except the garam masala and fry for a minute. Stir in the cashew nut paste and cook for another minute. Return the lamb to the pan and add 200ml cold water. Season and bring to the boil. Half cover the pan and simmer the lamb for 1 hour, stirring occasionally, until the liquid is reduced by at least half. Add the coconut milk and garam masala to the pan and simmer for a further 15–20 minutes until the lamb is tender and the sauce thickened. Add the lemon juice and scatter with chopped coriander. 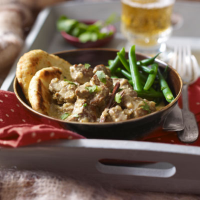 Serve with warmed naan bread and green beans. This recipe is ideal for a slow cooker, but you’ll need to reduce the amount of water. Cook on low for 6 hours, adding the coconut milk and garam masala for the last hour. Check manufacturer’s guidelines if you’re unsure.